(Vancouver) The BC Lions Football Club today announced that DeVone Claybrooks has been named the organization's 26th head coach in its 65-year history. Note: GM Ed Hervey and Devon Claybrooks will be available to the media in the dressing room at the club's Surrey Practice facility today at 1:00 pm. 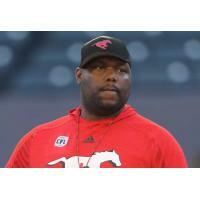 Claybrooks joins the Lions after serving on the coaching staff of the Grey Cup-champion Calgary Stampeders for the past seven years; most recently as the team's defensive coordinator dating back to 2016. "DeVone has been on the coaching radar of many teams for the past number of years and I believe he is the very best candidate to lead our team," said GM Ed Hervey. "After hours of meetings and discussions I know he is the perfect coach to usher in what is going to be a new era of success here in British Columbia." Coming off a convincing win over Ottawa in the 106th Grey Cup less than three weeks ago, Calgary's Claybrooks-led defence held down top spot in no fewer than 10 of 20 critical defensive categories tracked by the league in 2018 and placed in the top three of five others. "I am honoured and grateful for the opportunity given to me today by Mr. David Braley, Rick LeLacheur and Ed Hervey," said Claybrooks. "After meeting with Ed for a long period of time over the past number of days, I am beyond excited at the chance to lead a BC Lions coaching staff with the number one priority of winning a Grey Cup championship." "I am also tremendously thankful to both John Hufnagel and Dave Dickenson of the Calgary Stampeders who gave me a chance to coach soon after my playing days ended. Their faith in my ability has led me to where I am today." A native of Virginia, the 41year-old former defensive lineman attended East Carolina before joining the Green Bay Packers as an undrafted free agent in 2001. Claybrooks would go on to make a number of stops over five years in the NFL including a few in Tampa Bay where he earned a Super Bowl ring for the 2002 season. Eventually making his way to the CFL in 2007 and playing with the Montreal Alouettes for a pair of seasons, he signed with the Stamps and played another three years before joining the club's coaching staff in 2012 as defensive line coach. Over his five-year CFL career, he played 75 regular season games recording 161 tackles and 14 sacks.